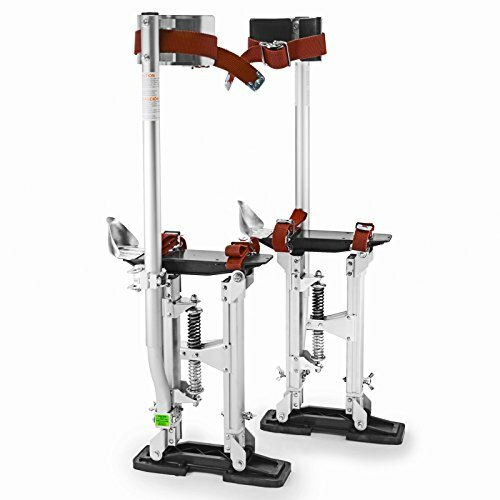 These premium drywall stilts by GypTool are built for professionals and suitable for drywall taping, painting, wiring, and much more. Precision manufactured from high-grade aluminum, these stilts are light enough to use all day, but sturdy enough to last for years. A non-rocking frame with overlapping, industrial strut tubes is paired with an adjustable dual-spring flex-system for excellent mobility. The height is adjustable using a wing-nut design; no tools are required to change the height. The shoe and leg straps are fully-adjustable with auto-locking buckles for quick stilt use/removal, and extra-wide padded calf braces plus three-position adjustable heel plates accommodate any user (stilts have 1 calf brace). The bases are made in large, textured, high-grade material that is non-marring to protect floors. Minor assembly required. Construction: Aluminum. Color: Silver (aluminum). If you have any questions about this product by GypTool, contact us by completing and submitting the form below. If you are looking for a specif part number, please include it with your message.